The severe crisis that hit the global economy in the course of 2009, was especially tragic for the poorest of the poor in Cambodia. Municipal dump labourers that were previously living on an average of 2$ per day saw their incomes slashed by more than 50% due to the fall of prices for recyclable materials. Furthermore, widespread lay off of factory workers and general economic downturn has forced families in precarious conditions on the streets on the brink of starvation, creating a new flood of children in desperate need of support. 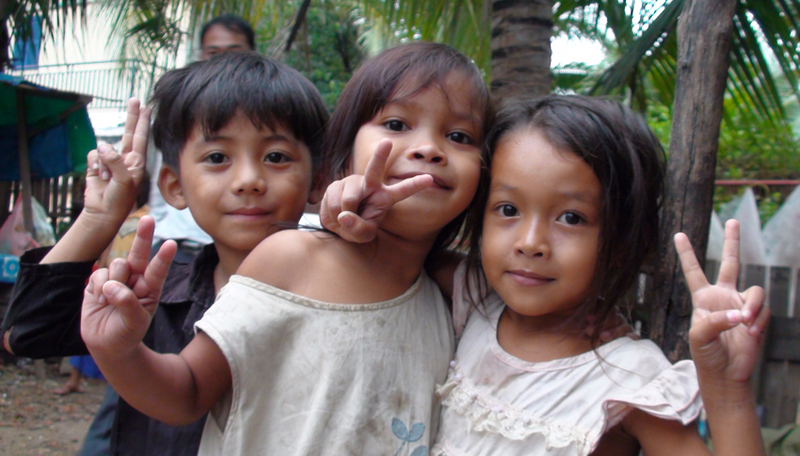 As a consequence, the Pistorio Foundation has increased the number of sponsored children in Phnom Penh. It has agreed to support the long-term education of 50 more children at the PSE centre. 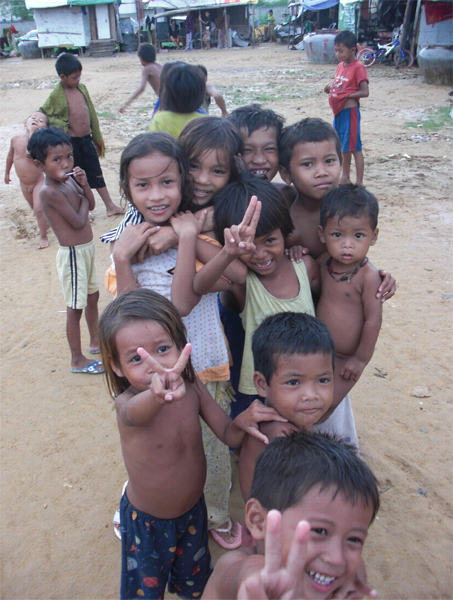 The Foundation hence currently sponsors the education of 183 children in Cambodia. In September 2009, Elena Pistorio, together with volunteers Sarah Meisch, Gianluca Lionetto, Angela Mitakidis – Cambodia Country Manager and Auditor, and Mike Mitakidis, undertook an audit visit to the PSE Centre in the Stung Mean Chey District of Phnom Penh, Cambodia, and interviewed families of children supported by the Foundation. One of the families interviewed was forced to relocate as a result of the closure of the Stung Mean Chey dumpsite area and now lives in a temporary make-shift shelter of the most basic kind. The Pistorio Foundation sponsors the elder daughter, Srey Peou who is now happy to be going to school and not working as a scavenger on the dump on weekdays. 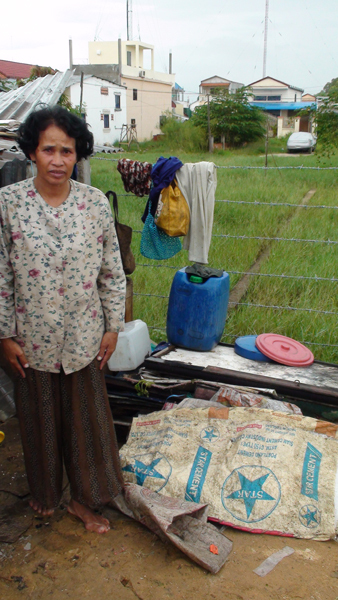 She still works on the weekends to support the family, earning 100riel (US$2.4) per day. Srey Peou lives with 9 other family members of three generations, however the families’ income is not sufficient to provide enough food for the entire family, despite the rice ratio it receives as part of the scholarship program to allow Srey Peou to attend school and not have to work during the week. Srey Peou’s mother’s health conditions do not allow her to work on the dump, and she scrapes a meagre income of less than 2$ a day sewing garbage bags that she sells and are used to collect recyclable waste. Still her income is irregular. Her grandchild of eight years old helps her sell groceries in the shelter, but this is hardly profitable. The family has a debt of 260$ that they used to buy a motorbike to the son so he could work as a mototaxi. She must now save money from her income to help pay the 2% interest and repay the debt. 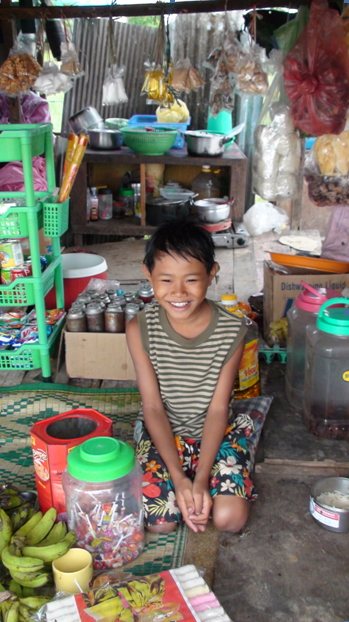 Srey Peou says she is so happy to be going to school, gaining knowledge and improving her future and that of her family. She dreams of becoming an accountant one day. The Foundation’s commitment to the children it supports is for the long-term, that is, from entry into the PSE school program through to completion of tertiary studies. The Foundation continues to be committed to be an instrument in bringing relief and hope to the children of Cambodia for a better future.